XM Converter - How to convert XM to MP3, WAV to play on any player easily? Convert, merge, cut, split XM audio files and adjust volume of XM easily with Bigasoft Audio Converter. Unable to play XM files of milkytracker with iTunes, Windows Media Player or QuickTime player? Trying to convert XM to a more popular audio format for sharing to friends or uploading to websites? XM is the most popular module file type which contains several audio channels and 16-bit samples. In order to play XM with popular players, like iTunes on Mac or Windows Media player on Windows, converting XM to a more popular audio format is necessary. In this guide, we will show you how to convert XM to MP3, XM to WAV in fast speed and high quality with the ideal XM Converter - Bigasoft Audio Converter. How to convert XM to MP3, WAV, etc. Firstly, download and install the powerful XM Converter - Bigasoft Audio Converter. There are two different versions for Windows and Mac users separately. And the two versions are fully compatible with the latest OS. Pick the right version to download and install. Convert XM to MP3, WAV or WMA, AAC, AC3, M4A, M4R, ALAC, MP2 and etc. Extract audio to MP3 format from video files, like MOD, MKV, MP4, WMV, WTV, OGV, WebM, AVI, MOV, etc. Rip MP3 from YouTube, Vimeo, MTV and other media sharing websites. Convert XM to MP3, M4A, M4R or WAV to use it as a ringtone for mobile. Merge, cut, split XM audio files or adjust volume, Bitrate, Sample Rate, etc. Convert video/audio files in fastest speed through multi-threading and run smoothly in multi-core CPU. Click "Add File" button to load the XM files to XM to MP3 Converter. Or just drag and drop XM files to conversion pane to import them. Click "Profile" drop down button and set the audio format you want. You may go to "Settings" button to adjust volume, bitrate, frame rate, audio channel or improve the audio quality. Hit the "Convert" button to convert XM files. After a few seconds, please click "Open Folder" button to locate the converted XM files and enjoy them with any player you like. 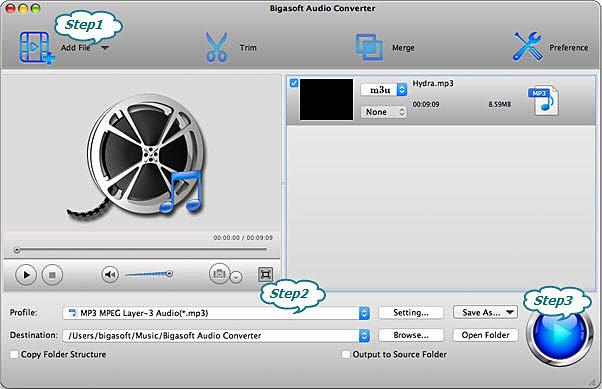 So, it is easy to complete conversion from XM to MP3 or WAV with Bigasoft Audio Converter. Want to try other features, like cut, merge? 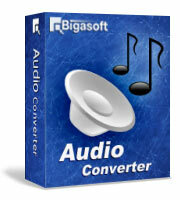 Just download Bigasoft Audio Converter to have a try.